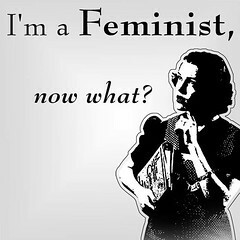 While I firmly disagree with the overly reductive and pretty offensive idea that that’s all feminism is (the system and society DOES in one way or another work against practically anybody who isn’t all of white, heterosexual, and male), I have to say that I can see how becoming invested in an “ism” can cause somebody to inadvertently end up using it the way antifeminists mean it. Interestingly enough, I came to this conclusion through capoeira—more specifically, through a maturing of my ideas in last-last week’s post about floreios, strength, and image in capoeira. First off, let me make one thing clear: ISMS (feminism, sexism, racism, homophobia, agism, etc.) are meant to be explanations, not excuses. If a woman who has earned and deserves a promotion does not get it because of sexism, that is an explanation, rightly used to point out social injustices in the world and how they work, in hopes of fixing the system. If, however, the woman has not earned nor deserves a promotion but cites sexism as the reason for not getting promoted, then she is using sexism as an excuse, in order to exonerate herself from the fact she didn’t work hard enough or needs to work harder in the future. What I think is that while everybody starts off with -isms as explanations, the more they become immersed in the world of their particular -ism and the more they learn about it and see just how prevalent it is, eventually, there may emerge a potential danger of unconsciously using that -ism as a personal excuse in addition to a legitimate explanation for “failure” or lack of achievement. In the floreios post, I pinpointed two things that I believe contribute to a capoeira training system that allows certain capoeira students to derive additional benefits from their capoeira training, as compared to less athletically-gifted capoeira students. These were (1) having or looking as if you have much physical strength and (2) an academy-wide strength-oriented, floreio-centric attitude regarding capoeira training that I termed “weight-class mentality”. In truth, there’s a third major factor involved, which I left out because I didn’t think of it until after having formed the full theory as I presented it, and because I was saving it for today’s post. The third factor is the mentality of the “bigger/stronger” capoeira students themselves. What I realized is that even though capoeira students do benefit hugely if the first two conditions of the “floreio effect” apply to them, it’s not as if they just sit back and do nothing all the while. Part of how the floreio effect works is that not only are premature impressions of the student’s “advancedness” reinforced in other capoeira students’ and teachers’ minds, they are reinforced in said student themself. So then it becomes a case of them not just attracting “enriched” training, but one where they also gain the confidence to put themselves in positions that enriches their capoeira training. For instance, sure big/strong capoeira students are challenged more often (and thus have their skills developed at an accelerated pace) by advanced belts in the roda, because some advanced belts assume that because they’re big and strong, of course they can take it, nevermind how long they’ve actually been training for. But part of the reason that happens is that the students themselves have the confidence to, and do, regularly buy in to play with the advanced capoeiristas! Here’s the important thing: That third factor? It’s not an external circumstance. It’s completely in the person’s control how much confidence they exude and whether they behave like they’re a beginner (shying away) or a more advanced capoeirista (taking chances and putting yourself out there), triggering further impressions in others that affect their perceptions of you as a capoeirista, despite whether or not you actually are beginner or advanced. Once I realized that, I felt that my floreio theory had begun to show a slight tear between the stitches. In a way, it was another -ism. For the purposes of this post, let’s call it “strengthism”. So while I still believe “strengthism” provides a legitimate explanation, without recognizing that third factor it was also possibly functioning as an excuse. Full disclosure: I never bought in with solidly more advanced capoeiristas in the roda, in my own group, before the “floreio effect” theory and everything I just wrote about occurred to me. I do now!!! Returning to feminism, or sexism/misogyny, in the context of capoeira there is also a danger of falling back into that as an “excuse” for not advancing. First, in no way am I discounting the sexism and misogyny that exists; it does, in all the forms and with all the effects on people that feminism describes. At the same time, the point where you take an -ism beyond what it can explain is when it turns into an excuse. Thus, sexism affects women in capoeira, but since there are still many women succeeding and advancing in capoeira, if you are a woman who isn’t, then it’s probably (for the most part) not completely fair to blame non-success totally on sexism. Does that make sense? To make it really clear, I’ll use another “strengthism” example from my own experience. Over the past couple months, for one reason or another, I’ve started to hear a refrain that goes, “technique’s fine, just need more strength [to do the move properly]”, or “good game, you would’ve killed if you were bigger”, and other similar comments that eventually did make me feel strength[ism] was the ONE thing holding me back from actually being good (or, to follow Angoleiro’s prudent example: “good” 😉 ). To be honest, I’m pretty sure my frustration over that was what brought the “floreio effect” to my attention in the first place. Finally, what?! “Would be” to “is” represents a somewhat large mental leap there. It’s like that comic strip with a huge scientific equation on the chalkboard, and halfway through there’s step labelled “then a miracle happens”! This is complacency: if I really did believe I was already “good” in all the non-strength aspects of capoeira (which I’m not, assuming good means “above average”), then it would be easy to blame all future non-success on lack of strength alone and not on possible weaknesses in those other areas. So then, I’d end up dismissive of moves I can’t get, stop paying attention to non-strength abilities, and ultimately become weakened in everything. Complacency is sneaky like that. Of course, that hasn’t really happened. But it did make me realize the potential “trap” one could inadvertently slide into by investing too deeply in or drawing too deeply on the explanatory powers of a particular -ism. It’s becoming complacent in the face of discrimination or extenuating circumstances, precisely because you’re so aware it exists. The ultimate irony is that if that happens, you will have kept yourself down even further than discrimination alone might have, completely defeating the purpose we have and learn about -isms in the first place. Good post! Just curious–what move were you working on when you were given the feedback ‘good technique, you just need to be stronger’? Strength definitely comes into play in capoeira but usually lack of strength prevents good technique so that’s why I’m curious about the comments you are receiving. I liked how you brought up the idea of examining ‘ism’s vs. making excuses. I’ve seen both very prevalent in capoeira. Generally, speaking men are better in capoeira. And generally speaking, many women don’t train as hard and don’t play as aggressively. There are many reasons for this and definitely sexism and cultural and social norms come into play. Of course there is a spectrum, when it comes to skill, strength, flexibility, speed, etc. Men and women fall in different places along this spectrum. I’m better than some men and some men are better than me when it comes to strength, speed, game, flexibility, etc. I don’t have much control over sexism and what people think about me as a woman. But I can control how I train. So I train as hard as possible, not to be better than men (some women fall into this trap) but to be as good as I can possibly be. Thanks again for your great post. I always look forward to reading your blog. Hi Panama, thanks! The move was going down as if you’re doing au, but then lifting your legs and switching them as you lower yourself in queda de rins, ending up in queda de rins but with your legs in meia lua de coluna position. So I was moving my body right and putting my hands in the right places and stuff, but my arms weren’t strong enough for me to be able to actually lower myself slowly onto them (as opposed to falling/landing ungracefully!). I have to say I actually haven’t seen it that much in my own experience, aside from literally -my- experience as I wrote about. You’re definitely right about the spectrum: every single person will be better than you at something, and worse than you at something, and vice versa. That’s interesting what you said about women falling into the “trap” of just wanting to be better than men. Could you elaborate on that a little? Oi Joaninha. The “good technique, not enough strength” definitely rings a bell with me. I know that when I first started capoeira, in class there would frequently be moves or sequencias that I understood how to do, but just couldn’t physically do them because my muscles weren’t strong enough in the right way. But I never felt that “not enough strength” was a static assessment of the situation. Capoeira movements make you use your muscles in ways that they haven’t been used before, and use is what makes a muscle strong, so if I wasn’t strong enough for queda de rin, it was because I’d never used my muscles for a queda de rin, not because I’m inherently lacking in strength. When people say “not enough strength”, I think it’s often more in the sense of “not enough strength yet”. The message to take away isn’t “lack of strength is holding you back”, it’s “practice the move more”. And YES I totally know what you mean about knowing the sequence or movement but not actually being able to do it! That’s one of the most frustrating things for me, ever…especially when people in front of me have the strength but have trouble with the movement/sequence, whereas I could dictate the entire thing step-by-step by memory but am relegated further back because I can’t do it physically! The absolute WORST is when there’s a sequence I actually *can* do, or can half-do, but the people who go first don’t remember it properly, so then the teacher assumes it’s just too hard for all of us and then *downgrades* the movement for the rest!!! Forget just strength, I’m trying not to bust lung during the longer match ups. Sometimes I’m in the Roda, and no one is buying in because the Contra Mestre is controlling the flow. After 4 minutes, while my strength is still decent, but I have the balance and coordination of a stringed puppet. My lungs are screaming for every bite of oxygen as my kick wobbles through the air. My opponent throws a kick and I don’t so much as dodge as I collapse away from the kick. Now I’m stuck with my stomach in the air, trying to be as menacing as possible with my crab walk. I kick from my floored position to keep my opponent out of my airspace while I’m trying to grab some clean air from the ground level. Then when we mercifully get out and back to singing, I’m still trying to muster enough air for the song for another couple minutes. So yeah, endurance is a feature to work on. Although I most often hear, “Robin, open up your legs more; move faster!” Contra Mestre is big on moving as fast as possible, while I’m big on doing the move in a manner that I can control. Haha, thanks for sharing, Robin. I think that definitely demonstrates that we all have our own personal trip-up points to work on! That’s interesting though, how you contrasted your Contra-Mestre’s preference with yours…wouldn’t he emphasize both, as in “kick fast but make sure you still have control”? I’m sure that if I was out of control he would reel that in as well. Otherwise, I think Contra Mestre want students to push themselves to new limits.